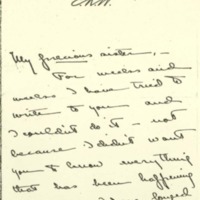 Eleanor Wilson McAdoo writes Jessie Wilson Sayre regarding her break up with Benjamin M. King. For weeks and weeks I have tried to write to you and I couldn't do it—not because I didn't want you to know everything that has been happening to me—I have longed for the love and sympathy that you have always given me, but because I couldn't bear to have my unhappiness spoil one moment of your happiness. I couldn't, couldn't do that, so will you forgive me, darling, darling Jetty, for not telling you everything before? Mother has just told me that you know—that she told you in her last letter the whole miserable story. If I had known, I couldn't have let her do it for it is a thing that I should tell you myself—but I felt that I could write to you only when I had found the truth. I couldn't make you unhappy with just the misery and doubt of the last month. To me it is a proof of how near and dear you are to me, that, since I couldn't tell you what was in my heart, I couldn't write to you at all. But, oh, I should have sent you just a little note sometimes—it has been so long since you left and it looks as if I hadn't missed you and oh, my darling and wonderful sister, I have missed you and longed for you so that sometimes I have felt as if I couldn't bear it—How can I talk to you this way—I want to tell you everything from the beginning, but it's so impossible to write it—if I could only see you for a little while. I made a terrible mistake two years ago—the realization has been coming slowly ever since last spring, but it is only now that I see the whole truth and know that it could never be hidden. I thought that I could hide it—that I would never let Ben or anyone else know that I didn't really love him the right way—but now I know that even if I had never loved anyone else I couldn't have done it. He is too fine and sensitive—I could have brought him nothing but greater sorrow than I have brought him now. I have been so terribly unhappy—I lost all faith in myself, and I have been almost dazed by the thing that was happening to me. For, you see, in the midst of all my uncertainty I played with fire—I let myself drift on and on in my wonderful friendship with Mr McAdoo and when he told me he loved me I found that he meant more to me than anyone else in the world.But oh, Jetty darling, will you believe me when I tell you that, even that, would not have made me desert Ben, if I had not found that it would be impossible to deceive him? I am not trying to give excuses for myself—I deserve every bit of blame there is—but there was no way but the way I have taken.Ben has been—oh, there are no words to tell you how splendid and sweet his is—I wonder if I will ever understand why I stopped loving him. I think that I have utterly wrecked his happiness—there doesn't seem to be anything left for him—and yet he has not thought of himself one moment through it all. If God will only let him stay well and strong—oh Jetty, isn't it all miserably cruel for him. I wonder if I can ever forgive myself—I am going to marry Mr McAdoo—when I am with him I am wonderfully happy for this is love such as I have never dreamed of before—I wonder what you are going to think of all this, beloved sister. I know that you will always love me just as much as ever, but I have been so silly, so unsteadfast, I am so humiliated when I think of my cruelty to Ben, that I can't believe that I can keep your respect—And do you like Mr McAdoo, dear? Will you be glad when I marry him? He is the only person in the world who can make me happy. McAdoo, Eleanor Wilson, 1889-1967, “Eleanor Randolph Wilson McAdoo to Jessie Woodrow Wilson Sayre,” 1914 March 4, WWP17482, Jessie Wilson Sayre Correspondence, Woodrow Wilson Presidential Library & Museum, Staunton, Virginia.